If one or more of the members of your household lives with limited mobility, you’ll know first-hand how difficult some of the most common, everyday tasks around the home can be. One area that poses a significant problem for handicapped members of the family is the bathroom. While our home’s bathrooms may not seem very dangerous, the very place where we spend a good amount of time every day is actually one of the most hazardous places in the house for all of us—but especially for handicapped, elderly, and anyone dependent on a wheelchair or walker for mobility. This is where reinventing your bathroom space with wheelchair-accessible products comes into play. Read along as we cover what’s new in accessible bathrooms, what’s involved in making those changes, and how you can make your dreams for a safer, more beautiful Charleston wheelchair-accessible bathroom a reality. At Charleston Bath Experts, we’re dedicated to providing our customers with the latest solutions in state-of-the-art, modern, Charleston wheelchair accessible bathrooms – with conveniences for the whole family. For those seeking a safer way to navigate their bathroom areas, our ADA-compliant barrier-free, roll-in showers can transform your home’s shower or bath into a secure zone for those that need more safety features and roll-in access while using the bathroom. Curbless Shower Floor: With a zero-threshold entry, your wheelchair can roll right in quickly, and the shower pant keeps the rest of your bathroom floor dry. Wide shower doors: No more trying to squeeze in a too-small shower door. The wider door of a barrier-free shower is customized to the ideal width you need for easier shower access. Built-in shower seat: Easily maintain your level of independence by being able to transition to a seat easily, so that showering becomes a safe and luxurious experience. Grab bars: Provides that secure object to hang on to during transitions and to help stabilize while standing. If you’re like most people, chances are that you’ll want to make sure your bathroom is upgraded with high-quality, modern features and looks beautiful, even with safer, more accessible installations. While safety and easy-accessibility should always be your family’s highest priority when updating your bathroom, rest assured that our design team at Charleston Bath Experts will make sure that your new installation is gorgeous, too. With our wide variety of stunning, ADA-compliant bathroom products in customizable colors, patterns, textures, and designs, you’ll be happy with the look of your new wheelchair accessible bathroom as well as the safety zone you’ve created in your home. How Can I Make My Bathtub More Accessible? Bath conversions are one of our most popular renovation choices for those seeking safer solutions for bathing or showering at home. With a tub-to-shower conversion, we’ll remove the existing bathtub that you no longer use and replace it with a spacious shower. 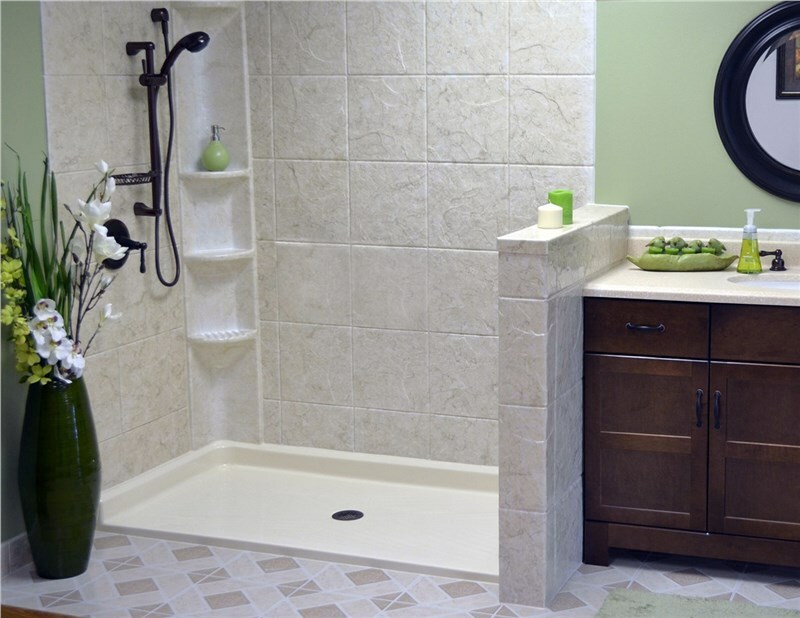 For your wheelchair accessible bathroom, choose a beautiful, barrier-free roll-in shower. The installation is fast, affordable, and can be completed in as little as 24 hours. Similarly, if you have a shower and want to replace it with an ADA-compliant tub, choose a shower-to-tub conversion, and we’ll upgrade your existing area with a stunning walk-in tub that’s customized to suit your preferences, style, and budget needs. At Charleston Bath Experts, we’re a family-oriented business with one goal in mind—getting you the Charleston wheelchair accessible bathroom of your dreams at a price that you can afford. Our superior installation techniques and top-quality products eliminate the stress of traditional renovations, for a fast and affordable remodeling experience that you can be proud of. To learn how you can transform your home with a wheelchair accessible bathroom, Charleston SC bath conversion, or another bath remodeling project, give us a call to speak to one of our friendly representatives over the phone. If you prefer to get started now, fill out our online form to schedule a free, no-obligation pricing estimate today.